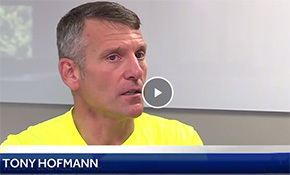 Col(R) Tony Hofmann has led a team of dozens of ultra-endurance athletes, mostly combat Veterans, to run in the Leadville, Colorado marathon for the past few years and has raised funds that help Veterans and First Responders battling post-traumatic stress. The marathon takes teamwork and endurance, something Veterans need to overcome post-traumatic stress. "It's really an emotional event, not just for the runners involved, even if you've done it multiple times; but also for the folks that are there at the finish line relative to the race," said Tony.